Restore your wood floors and stairs to their original beauty. Whether they’re new or 100 years old, we can make them shine again, change the color or update the style. Refinishing hardwood floors and stairs is one of the best ways to revitalize your home. Can your floors and stairs be refinished? Ask us today. How long will refinishing take? The length of the finishing process depends on many factors including the amount of floor that needs work, type of finish used, humidity and weather conditions. Water-based finishes normally take two days to apply, while oil-based finishes normally take up to three days. From the initial sanding until you can bring your furniture back into the room, it can take about five days. But if you need to use the room immediately, choose our UV-curing that sets the finish immediately so you can start moving in furniture the same day. A room must be furniture-free before we can work. If multiple rooms are being refinished, furniture will have to be stored in other rooms or even outside (depending on the weather). It may be best if you and your family stay elsewhere during the process. That depends on your expectations. If you’re expecting a floor that looks brand new without scratches, dents, dings, or spots with worn finish, then refinishing is the best option. If you don’t mind small scratches, dents, or areas with worn finish, then recoating is the best option. As you can tell, this floor is beaten up. It has had a lot of traffic by a door without a rug to collect moisture. The moisture just sat on the wood, breaking down the finish and exposing the wood to even more moisture and excessive scratching. Recoating would not remove the scratches or grey spots. The only option is to refinish it. 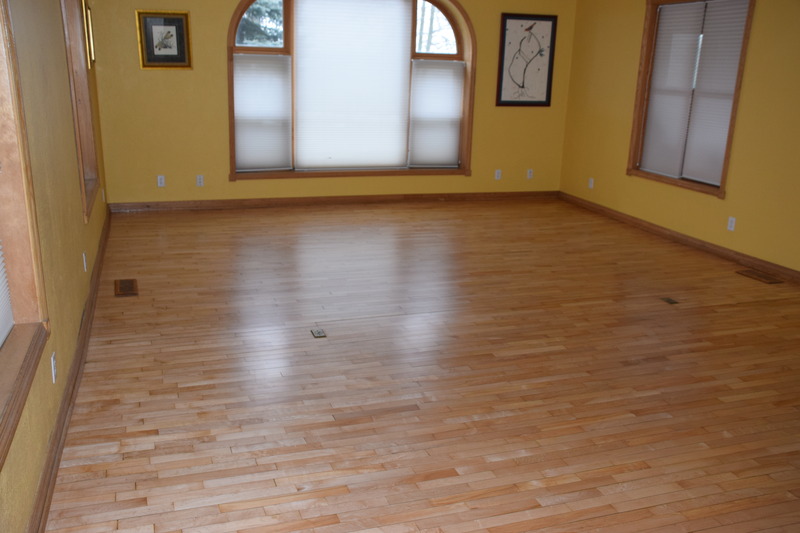 Cost to refinish hardwood floors? Great question! Like our other services, the cost depends on many factors: square footage of the area needing refinishing, the type of wood, number of coats, etc. To give you an accurate quote, we first meet with you to learn what you need and how you want your floor(s) to look. Download A Free Refinishing Guide!